The SIGG Strahltechnik GmbH based in Lauchringen specializes in the manufacturing of blasting technology systems and superfinishing vibrators. In addition to standard systems produced in series, the company manufactures customized systems of any shape and size. In-house commission blasting makes workpiece processing possible for customers without blasting systems or superfinishing vibrators of their own. SIGG Strahltechnik delivers common blasting abrasives, matching the systems, in various packaging sizes starting from 25 kilograms. Standard for all systems and blasting abrasives is always the best possible quality. High vertical integration combined with comprehensive knowhow in the blasting technology enable SIGG Strahltechnik to meet the highest of customer demands with fast reactions. The company stands for premium quality „Made in Germany“ , supplying customers from industries such as automotive, medical technology, machine and tool manufacturing, watches and jewelry, aviation, as well as handcraft businesses. With technical knowledge and the professional competence of over 20 employees, the company stays ahead of competition within the future-oriented special market of surface technology. From the smallest standard machine to the large customized system, customers counting on blasting technology systems and superfinishing vibrators by SIGG Strahltechnik always receive high-level premium quality. In order to meet this high demand, the company performs the development, design and manufacturing of the systems by itself. The dedicated team of engineers in mechanical engineering and electronics is in charge of the entire engineering of the systems, including the programming of the control units. 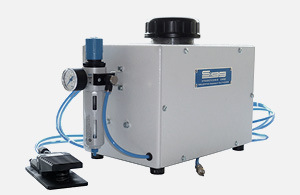 SIGG offers injector blasting systems in various sizes for cleaning, derusting, deburring or roughening of metals. 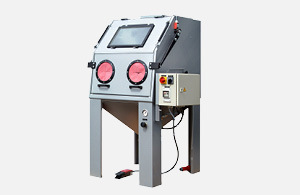 The systems are perfectly suitable for the use of fine-grained blasting abrasives, which can easily be exchanged. 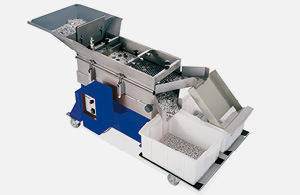 The universally applicable machines are extremely robust and ergonomically built. 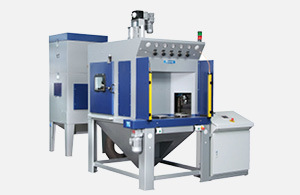 A rotary table blasting system by SIGG is the right choice for blasting large quantities. 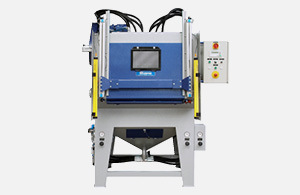 The system is suitable for automated blasting. The rotating indexing table and the attached satellite plates are the key elements of rotary table systems. The system is equipped with an SPS-control. 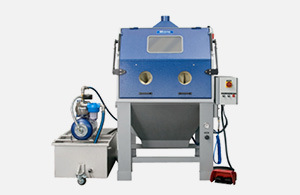 First choice for blasting numerous, small workpieces is a rotary basket system based on the injector blasting principle by SIGG Strahltechnik. 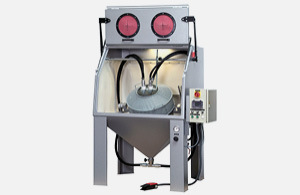 The principle of this technology: The blasting abrasive located in the collection hopper gets sucked up by the injector air generated by the gun before being further accelerated by the supplied compressed air inside the body of the gun. Fine blasting systems by SIGG Strahltechnik make different work processes on single workpieces possible, and equally allow workpiece processing without change of the blasting abrasive. Workpieces to be processed derive from the medical technology, precision mechanics, electronics, electrical and mechanical engineering, dental laboratories and watch manufacturing. 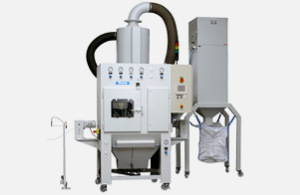 Vapour blasting systems by SIGG Strahltechnik enable targeted blasting. The differently sized models are available either with a side channel blower or a platform for the processing of even large workpieces. Also complicated constructs obtain a perfect surface through the vapour blasting principle due to its trouble-free and convenient handling. Superfine surfaces are excellently achieved with wet blasting systems by SIGG Strahltechnik. Watches, jewelry and products in the medical technology area obtain superfine matting. Wet blasting systems by SIGG Strahltechnik are available in various sizes. Optionally, and in addition to the agitator, a sludge pump can be delivered. Tumblast systems are especially suited for the surface treatment of small, loosely fitted bulk material. SIGG offers tumblast systems in various sizes used for a wide range of applications: Cleaning, descaling, roughening, matting, deburring, refining, calendering and lapping by utilizing commercial blasting abrasives. Finishing vibrators by SIGG Strahltechnik are used for trowalizing, precision deburring and polishing of steel, non-ferrous metals and plastics in batch processes. 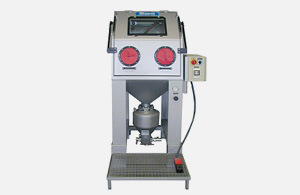 Due to the high vibration frequency, workpieces can be blasted without any deions. For this purpose, the workpieces and the abrasive bodies performing as bulk material are placed into the container of the machine. SIGG manufactures customized models and entire systems especially designed for the customer’s needs and carrying the label „Made in Germany“. The customized models built by SIGG Strahltechnik on the customer‘s behalf are based on either vapour or injector principle, or a combination of both. The testing laboratory is implied in many development steps.